Hello sketchers, here is my contribution to the observation of SN 2014J. From Jan. 23rd till Feb. 11th I spend a lot of good time with the M82 supernova. Sketching the galaxy, estimate the visual magnitude and made watercolour of the sceneries. Sometime I observed with friends and their materials, sometime I’m alone on the middle of no where, between the Provencal wild nature and the dark sky. Here in south France the temperature is quite high for the season but wind blows, so, often I place my car to protect the 12” Dobson from the mistral. Attached is a kind of “auto portrait” (yes, that’s me! ), from a photo I take tonight. On the basis I add the AAVSO curve with my own visual observations (blue cross is DMIB). The technique used is inverted watercolour, so I invert the colours of the sketch while scanning. For the galaxy this is common sketch black on white – inverted. Thanks to read this, clear sky to you all ! This is a wonderful artistic display. I like the fine sketch of M82 with the supernova visible; in addition the watercolor shows you and your scope pointed northeastward approaching 40 degrees or so and Orion and Canis Major in the sky above your auto. 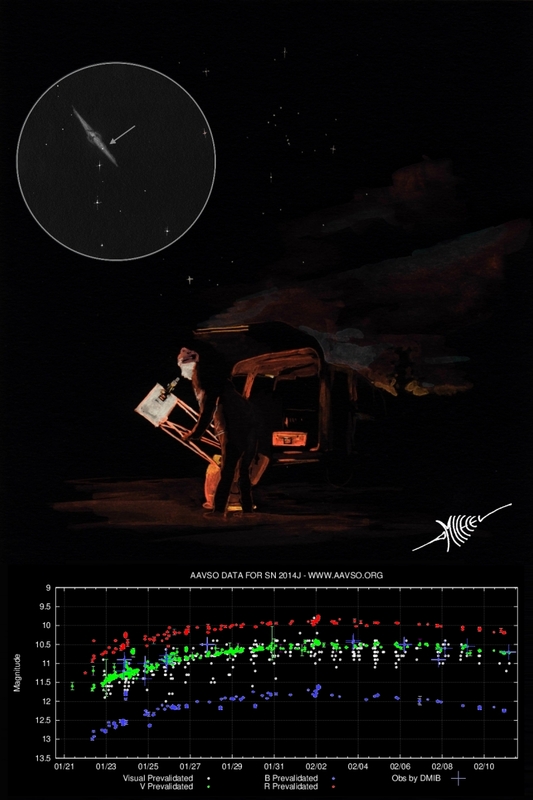 Then the sketch has your data along with the data reports of the AAVSO. This is an impressive post. Good combination of art and science. Fine job. Thank you to you all for those nice comments! Indeed Frank, this sketch is a real situation one, the telescope is pointed to M82, your eye is good! Thank you Dale. I appreciate.